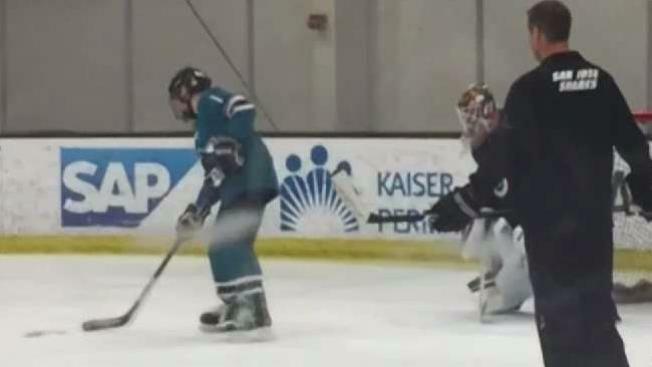 A Bay Area teenager who has been through a lot lately is getting the chance of a lifetime thanks to the San Jose Sharks and the “Make-A-Wish Foundation. Hayden Bradley began a three-day dream trip on Friday, having the opportunity to travel along the Sharks to Anaheim. Bradley was born with pulmonary atresia and spent his first month of life in the NICU. Before the age of seven, Bradley had undergone four procedures but he persevered. Today he continues to do so despite having the most trying year of his life. “Can’t wait until I get to go out there and shoot some pucks and talk to the players,” said Bradley. For Bradley’s first day, he got the opportunity to join the Sharks players on the ice, shooting pucks and scoring relentlessly.